Split charging allows one charging source (generator, alternator, fuel cell, solar panel, etc.) to charge multiple battery banks. A split charging system that charges multiple batteries must also allow each battery bank to discharge independently. Consider a system consisting of an engine, alternator, starter battery, and auxiliary bank. The alternator must charge both the starter battery and auxiliary bank. However, when the auxiliary bank is discharged, the starter battery should typically be isolated to ensure that the engine can be started even if the auxiliaries go dead. Legacy split charging battery technologies such as Battery Isolators waste a lot of power. Battery Isolators using diodes contain large heat sinks because much of the power intended for your batteries is shed as heat. 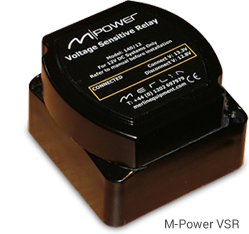 Diode-based Battery Isolators also introduce a problematic voltage drop. Consequently, batteries are not charged at the correct voltage (undercharged). Furthermore, overcharging occurs when a starter battery is in a system with a relatively large auxiliary bank. (This is a problem even with FET isolators and smart alternator regulators that attempt to address the issue.) Merlin’s split charging products are all zero-loss (do not introduce a voltage drop). Legacy split charging relays do not suffer from the efficiency, undercharging, and overcharging problems of Battery Isolators. However, these relays are susceptible to large currents drawn across the relay when the engine is started while there is a large load on depleted auxiliary batteries. The large current can result in a meltdown of the relay and possibly induce fire. Merlin’s VSR and SmartBank products have overload protection and contactors rated for large cranking currents. Intelligent split charging systems like ours offer more than legacy systems. Emergency paralleling offers the ability to jump-start the engine, power emergency communications, or other equipment from the auxiliary batteries. Priority charging allows you to configure your system so that certain battery banks are charged before others. The most common example is charging your starting battery before your auxiliary banks. Finally, it is possible for one battery bank to be nearly depleted while another is still fully charged. generator start, load shedding, etc.